At LilyRoot, we believe that flowers elevate the quality of our lives. For us, there are no RULES for flower design, if it is aesthetically pleasing to the eye, the heart, and the mind, it is a masterpiece! We continually strive to bring our customers the most innovative, unique, and individualized floral designs. We love to create our flower designs with the words original, artistic, masterful, opulent, lush, lavish and inspired in mind. 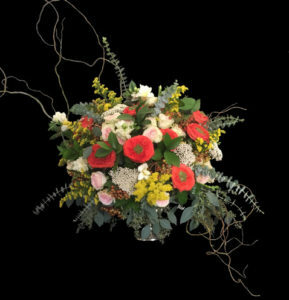 We are experts in providing one-of-a-kind arrangements in many styles, such as classical, whimsical, bohemian, contemporary, garden bespoke or Asian inspired simplicity. We joyfully accommodate any and all of your floral needs— get well wishes, new baby, funeral and sympathy, prom corsages, weddings, showers, flower crowns, garland, and flowers for any holiday. We work with you to deliver the PERFECT floral statement for any event or occasion! We are committed to a “field to vase” mentality. A design with flowers should enhance their natural beauty and take your breath away! That is why we purchase all our flowers, greens, and plants directly from grower’s farms, fields, and greenhouses locally and throughout the USA. This allows us to bring you only the freshest, longest lasting, and most beautiful cut flower designs. We love to use unusual and unique containers to enhance our floral designs. In our shop, you will find all kinds of interesting and unusual vessels including recycled glass, repurposed wood and metal, and vintage estate sale finds. Always environmentally conscious, our shop recycles and limits use of plastics and other non-biodegradable materials. Our designers have Advanced Floral Design certification from the Floral Design Institute to insure that the flowers you order from us are the best they can be! Please visit our retail shop on the South Waterfront, at the corner of SW Gaines and River Parkway where in addition to flowers, you will find an elegant and whimsical array of succulents, candles, plants, greeting cards, and other inspired gifts for you, the hostess, pet lover, or new baby – We are happy to offer free all-occasion gift wrap!